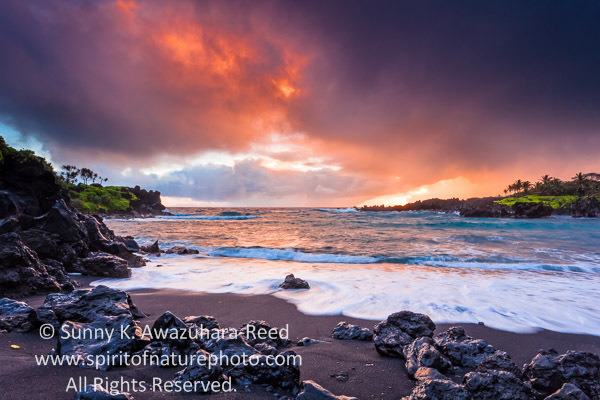 The East side of Maui offers dramatic landscapes that photographer’s dream of: lush rainforests, waterfalls, and secluded beaches. 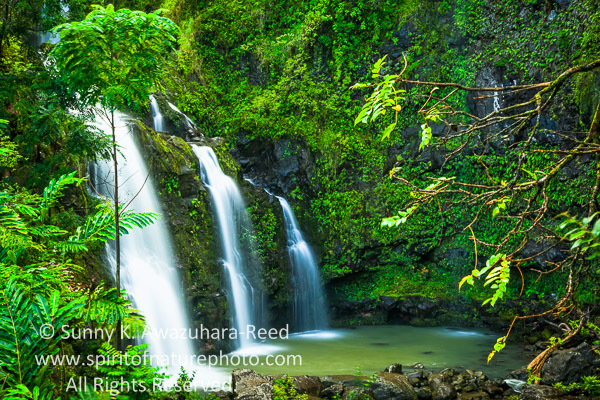 Greens and waterfalls are always my favorite subjects to photograph in Hawaii. In December, I flew to Maui for another photo project. It is always good to take a break from the cold, dark winter in Alaska. However, unexpected storms visited Hawaii for weeks in December and instead of sunny tropical weather we got rained on almost every day. "The Road to Hana," was one of the highlights of this Maui trip with the lush tropical forest and countless waterfalls along the highway. Driving through the scenic coastal highway in drizzling rain. The trails to the waterfalls were wet and muddy after many rainy days. The good news was the waterfalls were fully cascading through the mossy greens. Gorgeous volume of water for photography! Makapipi Falls vertically drops down under the bridge along the road (left). 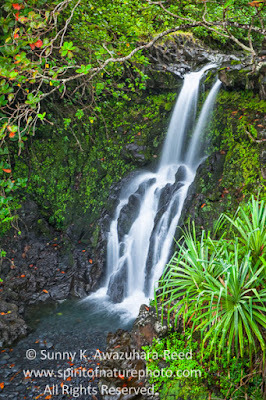 Artesian Falls cascading down to the coast. 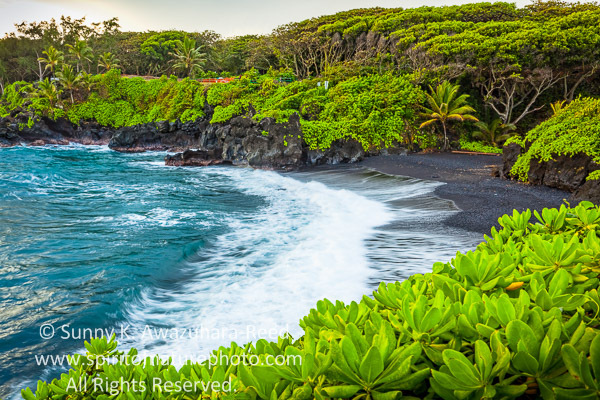 Near the end of the highway, a volcanic black sand beach lays on the quiet corner of Maui. I was waiting for sunrise on the high cliff in misty rain. The weather changed every few minutes... The orange light broke through the clouds and it painted the dark sands purple! Soon the lights were blocked and rain took over the cove. 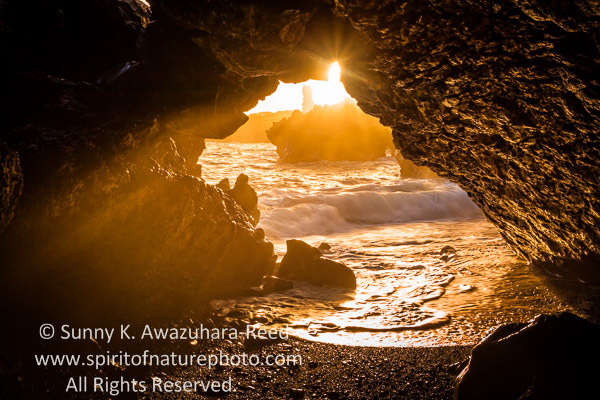 A short while later, the sun came out again and the golden light lit through the sea cave. The sun beat out the clouds for most of the day. 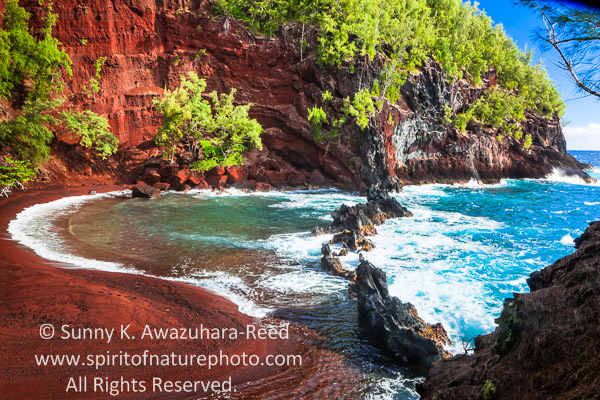 There is also the Red Sand Beach near the town of Hana. The beach was bright red under the sunshine. 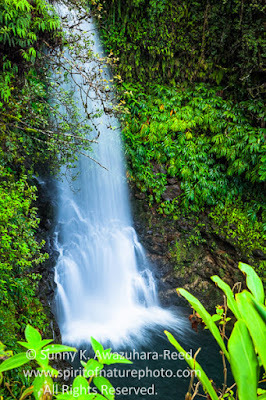 The Hawaiian nature is full of surprises! 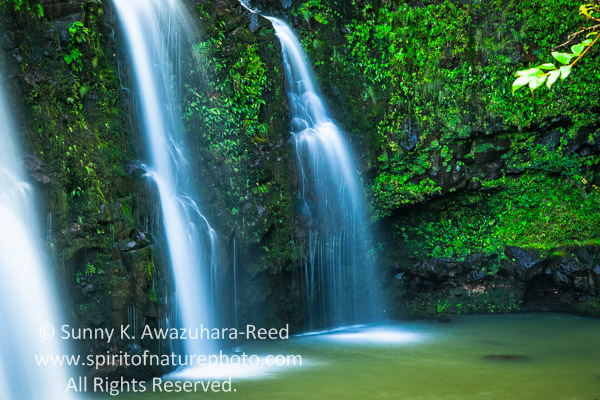 On my next posting, I will share some photos of Seven Sacred Pools and the bamboo forest in Haleakala National Park, East Maui. Please check back.